Home » The Salon of Madame Récamier. French revolution fashion at Paris in 1794. The Salon of Madame Récamier. 1794 Paris. 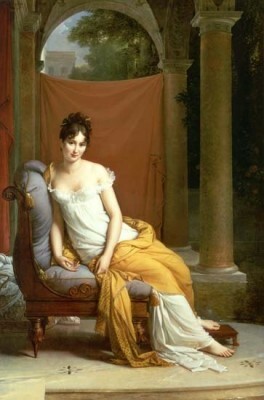 Although one includes the name of Madame Récamier amongst those who have always been associated with the Merveilleuses, she is scarcely to be classed as being merely one of the leaders of fashion and beauty, for she had talent and force of character which placed her high above her surroundings, and her name will be still remembered when those of so many others of the time have been long forgotten. This eulogy does not appear excessive when one remembers that the object of it was considered at that time not only one of the most beautiful women in Europe, as is proved by David’s well-known masterpiece, but also one of the most remarkable characters of her time. At the proved by David’s well-known masterpiece (In their time, Juliette Récamier was one of the most beautiful women and was painted by renowned artists, including by Jean-Auguste-Dominique Ingres, Francois Gerard and Jacques-Louis David, who painted it on a Récamier, a piece of furniture was named after her in the style of a sofa), but also one of the most remarkable characters of her time. At the early age of twenty, her superb mansion in the Rue du Mont Blanc was the most sought after by every one of the time who was any one. Few women have had a life so eventful, so filled with conspicuous incidents, and so brilliant in its successes, as Madame Recamier. She was the daughter of a notary named Jean Bernard, and from her youth gave signs of great promise, for at quite an early age she was an excellent musician on the harp and piano, and a graceful dancer. The growing beauty was already being talked about when she attracted the notice of Marie Antoinette in 1784, who sent for the girl, to compare her with her own daughter, who was then considered very beautiful. The Salon of her mother, Madame Bernard, was at the time the rendezvous of the principal political men and beaux-esprits of the time, and it was here that her daughter, who was then only sixteen years of age, met her husband, a rich Parisian banker, Jacques Rose Recamier, twenty-six years older than herself, and with nothing much to recommend him except his wealth. The marriage turned out a failure, but the young wife was clever enough not to wear her heart on her sleeve, so to the world they were outwardly devoted. She was ambitious, and the wealth of her husband helped to carry out her projects. Her great aspiration was to be surrounded in her Salon by a circle of friends amongst whom should be all that was most distinguished in the Paris world, and in this, as is well known, she was successful beyond her wildest dreams. There are probably but few Salons which achieved such distinction as that of Madame Recamier in 1800, the magnificence of the surroundings forming a splendid framing for the exquisite beauty of the hostess. 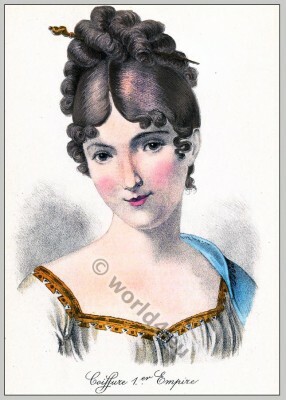 It was not until the commencement of the Consulate that her real career as a political and social hostess started, although her beauty had already created a sensation during the Directoire, and had attracted hosts of admirers, amongst whom was no less a personage than Lucien Bonaparte, the brother of the future Emperor. It is well known that Monsieur Recamier had bought the splendid Hôtel in the Rue du Mont Blanc for her as a surprise gift, and Berlaut the architect had been engaged to transform the place into an enchanted palace. Berlaut had not only taste, but exquisite taste, and had never been unsuccessful in arranging a house. That of Madame Recamier was one of his most successful efforts: the dining-room, the bedroom, the small drawing-room, and the grand salon were all magnificently and elegantly furnished. It was here that the first ball to be given in a private house took place, the balls given by ministers and foreigners not being in the category. The balls that Madame Recamier gave were the most brilliant that had hitherto been seen in Paris, and she did the honors with such perfect grace and modesty as to gain all hearts. Madame Recamier was the first to hold receptions. She of course received a great many people by reason of her husband’s position, but, apart from this, she had her own world, a world that was more in unison with her own perfect taste and love of genial friendship, with the result that she established a definite coterie of her own, and in spite of her youth she achieved the honor of being considered a prototype for all other women. Madame Dwoff and her husband, the Duchess of Gordon and Lady Georgina, Mr. Fox, Eugénie Beauharnais, the beautiful Duchesse de Courlande, Lord and Lady Yarmouth, Monsieur de Chateaubriand, Adrien and Mathieu de Montmorency, Madame Ouidner, and a host of others equally noted, which space, however, prevents one mentioning. These are, no doubt, sufficient to give an idea of the entourage her personal charm, kindliness, and remarkable beauty had attracted, and made her Salon one of the most famous of the time. Her visit to London, 1802, still further emphasises the extraordinary charm of her personality; she was the talk of the town, and was received by the Prince of Wales, the Duchess of Devonshire, the Duke of Hamilton, and many others. It is related that people who did not know who she was would crowd round her when she appeared in public, so remarkable was her beauty. This entry was posted in 1794, 18th Century, Directoire, France, Incroyables, Merveilleuses and tagged French Directoire style, French Revolution Costume on 3/18/13 by world4.